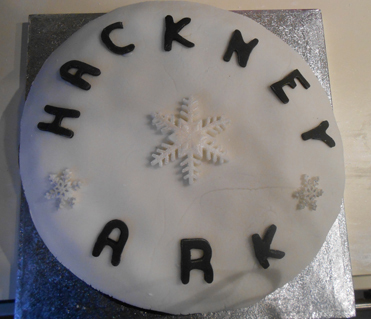 This Cake was made for Hackney Ark’s winter party, and I was delighted to make it, because we’re one of the families who’ve benefitted from services from the Ark. Sift the dry ingredients together. Combine the wet ingredients in a jug. Make a well in the dry ingredients and pout in the oil and water mixture and beat well. It should give a thick glossy batter. Pour into a 23cm cake tin and bake at 170 / 150 fan oven until a skewer comes out clean. The texture is quite dense and ‘cakey’ rather than sponge like. I iced this one using apricot jam and fondant icing, which is egg / dairy free too. I’ve lived in London for 25 years, and Hackney for about 20 years so I’m probably here for good now. I work for a disability charity in Kings Cross. I usually make birthday cakes for my two boys and we have great fun coming up with designs. Even when the cakes turn out a bit different it doesn’t matter. There’s something special about something being made for you – even if it isn’t perfect. That’s why I decided to volunteer when I came across a flyer for Free Cakes for Kids. It’s still a bit nerve wracking baking for other people though! « What’s your 2013 New Year’s resolution?